This article is intended for Ad Networks who are using the Everflow platform and would like to become an integrated partner with AppsFlyer. AppsFlyer is able to send attribution data to Everflow for both installs and in-app events. To initiate the integration with AppsFlyer, complete the Partner Registration Information Form. If you currently have an intergration with AppsFlyer, contact partners@appsflyer.com including your new Everflow postback and tracking link template. The tracking link consists of the below AppsFlyer base tracking link and additional macros added by the ad-network. 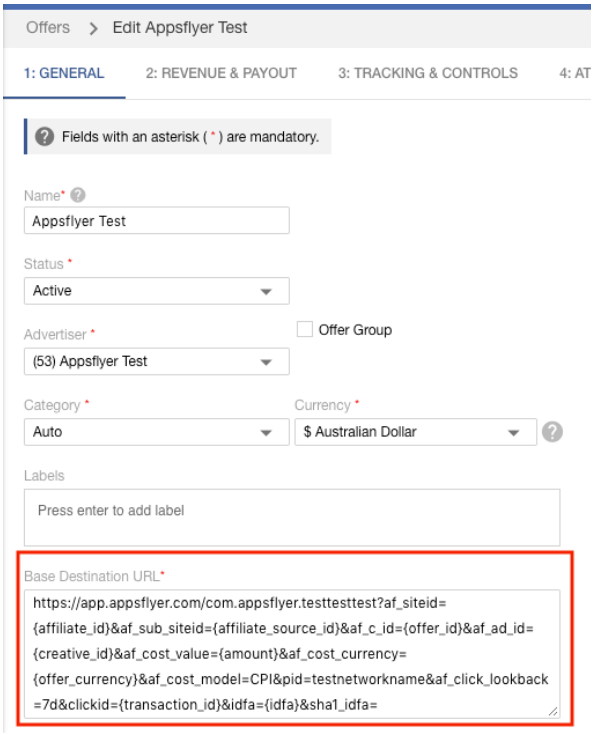 If you are an existing AppsFlyer partner and currently migrating to Everflow from a different platform, make sure to add &af_additional_postback=1 to your tracking links. For AppsFlyer’s complete list of parameters click here. For Everflow’s complete list of macros click here. NID is the Network ID provided by Everflow. The unique in-app event ID generated by Everflow for each offer event. This is the actual in-app event name from the application. To setup the events on the offer level, use the guide here. After you have setup events, remember which event ID is for each. Add these events into the AppsFlyer tracking link. You must have one event ID per "&goalid_x" value. Add these to the AppsFlyer tracking link in the General page after you edit the offer. Add the &goalid_1=275&goalid_2=276 to the AppsFlyer tracking link and click save. Ask the advertiser to map those events in AppsFlyer, For details of Dynamic Event Mapping for In-App Events, click here. Pull event postback from everflow and send it to AppsFlyer, make sure you are mapping the right goalid macros to the corresponding events on the advertiser's side.